With its cabin-like design and plenty of room to stand and move, the Coleman 8-Person Montana Tent feels more like a house than a tent at the campsite. It’s designed to hold up to the weather. Specially angled windows let in the light, but not the water when it rains-even when they’re open. Insta-Clip Pole Attachments stand up to high wind and the WeatherTec System’s patented welded floors and inverted protected seams help you stay dry. The snag-free, continuous pole sleeves mean you only have to feed the poles once-reducing setup time to just 15 minutes. The spacious interior is large enough to fit 3 queen size airbeds. Before you lie down, attach the fly for protection from the rain, or on dry nights, gaze at the stars through the mesh roof. A hinged door provides easy entry and exit, and a touch of at-home convenience. Ideal for outdoorsy families and extended camping trips, the Coleman Montana 8 Tent offers a full feature set for a fun family camping experience. It sleeps up to eight comfortably, thanks to a generous 16-by-seven-foot (W x D) layout and spacious center height of six feet, two inches. An innovative hinged door makes for easy in-and-out, and a vented Cool-Air Port and privacy vent window help improve airflow and keep things fresh. A convenient electrical-access port lets you run a cord from your device in the tent to a power supply outside, and an interior gear pocket keeps things organized. The tent’s modified dome structure includes a covered front porch and wings for plenty of outdoor living space. Setup is fast and simple, thanks to shock-corded poles, continuous pole sleeves, an exclusive pin-and-ring design, and InstaClip attachments. Stake and pole bags, as well as a convenient storage and carry bag with instructions sewn in, are also included. Coleman has been in business for more than 100 years, and continues to produce high-quality, affordable tents, lanterns, table-top stoves, and more. 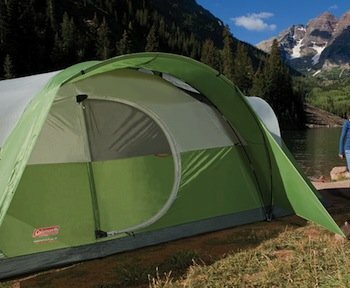 All Coleman products have a warranty against defects in material and workmanship, and the Montana 8 Tent includes a limited one-year manufacturer’s warranty. 16 ft. x 7 ft.